Welcome to the online edition of the New England Vegetable Management Guide! 2018-2019 New England Vegetable Management Guide is a comprehensive guide to current production and pest management techniques for commercial vegetable crops. The 2018-2019 New England Vegetable Management Guide is also available in print and may be ordered online or from any of the New England Extension state publication offices. 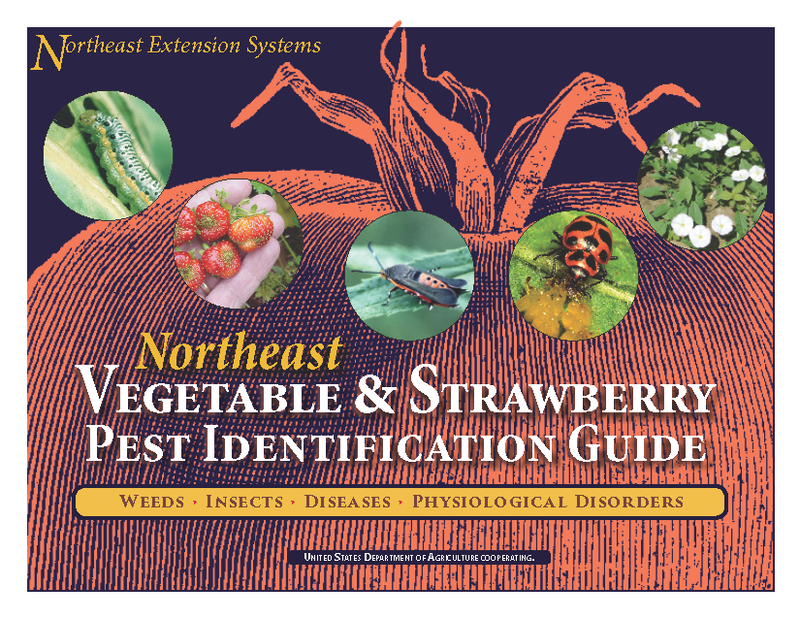 When you purchase a copy of the 2018-2019 Guide you can also receive the Northeast Vegetable and Strawberry Pest Identification Guide (Guide only, $25.00; Guide plus Pest ID Guide, $30.00). The Pest ID Guide may also be purchased separately for $15.00. Cultural practices for vegetables, including soil fertility and nutrients, soil management, cover crops, organic production, raised beds, irrigation, and much more. Vegetable transplant production: a comprehensive coverage of this key component of vegetable production from seed to media to growth management to IPM in the greenhouse environment. Pest management covers general topics such as an overview of weed, insect and disease management and integrated pest management (IPM), organic and biorational pesticides and biological controls, updated tables for pesticide products and label information, pesticide safety and the worker protection standard, pollinator conservation. Crops section: you will find recommended cultural practices, varieties and nutrient recommendations for each crop, along with specific information on management of weeds, insects and diseases for that crop or crop group. Pesticides for weeds, insects and diseases have been updated. This manual is a collaborative effort of members of the Extension Vegetable Programs of the Universities of Maine, New Hampshire, Vermont, Connecticut, Rhode Island, and Massachusetts. The information presented here is updated as of July 2017 and contains the best available knowledge at the time of posting. Any reference to commercial products, trade names or brand names is for educational purposes only, and no endorsement or approval is intended. Regarding pesticide information provided in the New England Vegetable Management Guide: the user of this information assumes all risks for personal injury or property damage. If the information in this guide does not agree with the current labeling, follow the label instructions.The label is the law. The Northeast Vegetable and Strawberry Pest Identification Guide is available online in pdf format (click image below) and in print, see ordering and downloads. Contact your state Extension publication office, or the University of Massachusetts Extension Bookstore at 1-877-UMASSXT or 413-545-2717 (within Massachusetts).